You'll be £12.99 closer to your next £10.00 credit when you purchase My Boy Jack?. What's this? Order within the next 8 hours, 11 minutes to get your order processed the next working day! Republished to coincide with the new ITV film, My Boy Jack? 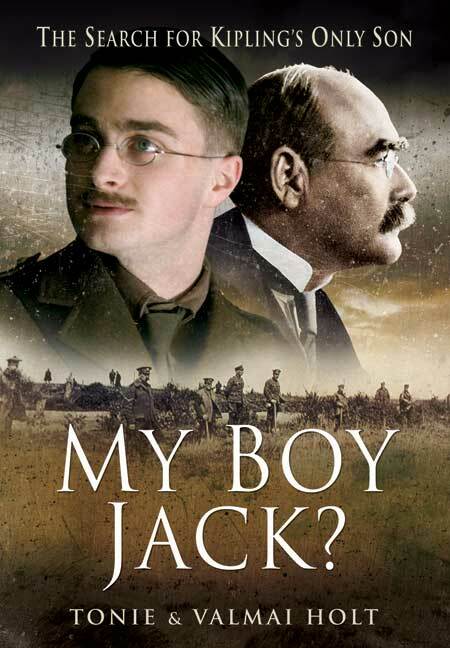 starring Daniel Radcliffe, this is the full account of the tragic life of John 'Jack' Kipling. On 27th September 1915 John Kipling, the only son of Britain's best loved poet, disappeared during the Battle of Loos. The body lay undiscovered for 77 years. Then, in a most unusual move, the Commonwealth War Graves Commission (CWGC)re-marked the grave of an unknown Lieutenant of the Irish Guards, as that of John Kipling. There is considerable evidence that John's grave has been wrongly identified and for the first time in this book, the authors name the soldier they believe is buried in 'John's grave'. This is the first biography of John's short life, analysing the devastating effect it had on his famous father's work. This well researched and written account comes to very different conclusions. As anyone who has seen the BBC film with Daniel Radcliffe will know, Kipling's son John was reported missing after the battle of Loos in Autumn 1915 and it is pretty certain that he was killed at barely 18 in his first contact with the enemy. Kipling made desperate but unavailing efforts to locate the body, in the course of which he wrote a detailed history of his son's regiment, the Irish Guards, and became a leading and possibly the most energetic member of the War Graves Commission. In 1992 that same organisation decided that a previously unidentified body must be that of John Kipling. However the authors (backed up by four experts) are strongly of the opinion that this is incorrect and that the body has never been found. They give their reasons in compelling detail. For any reader focussing more on a particular ancestor, the sections about how the work of recovering and identifying bodies was done are interesting. The insistence by the War Graves Commission that all the dead should be treated equally and none repatriated was very much Kipling senior's view, and was not universally accepted at first. This not surprising considering the class-ridden attitudes that assumed a barely 18-year old boy of modest stature and poor eyesight would be a suitable person to command a platoon. One of the most horrifying statistics of that awful war is that only about half of the dead were identified. One would guess that as there were many fewer officers than men it would have been easier to put names to them. This failure in the case of Kipling's son reminds us how hopeless would have been most efforts to find a specific ordinary soldier. The vast majority of relatives did not have the resources to even try. A novel, if good, you may read cover to cover never putting it down; when you do put it down you are unlikely to read it again. A history book such as ‘My Boy Jack?’, with such a powerful and intricate narrative, you put down because of its intellectual weight. It has taken me a second reading of ‘My Boy Jack?’ to begin to appreciate and hold in my head the detail that it contains. It deserves a third reading, and life on a shelf of choice books on the First World War for reference purposes and to indulge a variety of interests: ‘My Boy Jack?’ provides insights like no other. We gain a fabulous insight into the life and career of Rudyard Kipling, and through his eyes the British Empire in the late Victorian and Edwardian eras carried by the thread of his behaviour and feelings as a parent. I could imagine another title for the book, say ‘One life to give’, if we are to quote from Rudyard Kipling’s poetry as is done with ‘My Boy Jack?’ Another, alternative title, could be ‘The world must be saved from the Germans’ as ‘My Boy Jack?’ is a tale of sacrifice: we learn about the loss of other young men before John Kipling is killed. Overall, it is refreshing to read in detail about the life, experience, death and aftermath of a young officer from a wealthy middle-class background as at times one is made to feel in these centenary years that the First World War was only experienced and suffered by the ‘the working class volunteer’.